Discover the romance of a Victorian wedding. Explore our wedding website for all the resources needed for wedding planning. See Victorian wedding dresses and a gallery of wedding photography. 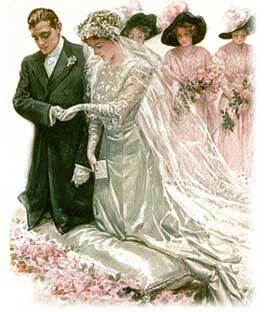 Read about 19th century engagement traditions and bridal customs. Find ideas for wedding rings, wedding photography and wedding favors. Wondering what to wear and what to bring to a Victorian wedding... learn what is required of the ideal wedding guest. 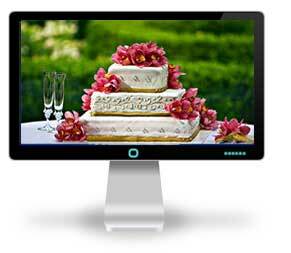 Find photos of Wedding cakes and make your own wedding cake boxes. Everything needed for a romantic Victorian wedding theme! To Gather Orange Blossoms Of all Victorian bridal customs and traditions, wearing a wreath of flowers is the most popular. Many enchanting legends are remembered of maidens entwining fresh orange blossoms into a bridal wreath for their hair. The influence became so indoctrinated into the culture that the phrase "to gather orange blossoms" took the meaning " to seek a wife". Wedding Dresses from Harpers Bazaar Envision Victorian wedding dresses taken directly from the fashion magazine, Harper's Bazaar. The world famous Harper's Bazaar magazine has been a fashion authority for well over a century. Discover elegant designer wedding dresses from the past for inspiration in planning your own special bridal gown. Victorian Wedding Fashion Prints View this collection of hand-colored antique fashion art prints of beautiful Victorian brides. All fashion art prints were published for young Victorian women in period magazines. Imagine how many Victorian girls dreamed of and planned their weddings while viewing these beautifully hand colored fashion art prints. Framed antique prints like these would make a memorable wedding present or shower gift. Queen Victoria’s Wedding Bouquet Young Princess Victoria was sensitive to the language of flowers and plants as well as to the magic and power of their fragrances. Her attention to detail when planning her wedding set many bridal customs in place that remain dear to us today. Vintage Wedding Consider the soft flowing lace, net an gauze wedding dresses of the early 20th century to accect a traditional vintage wedding. Search through photographs, pick out vintage flower girl dress styles, and more. 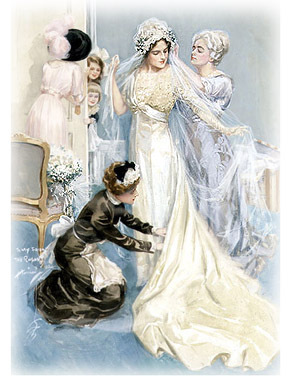 Miss Vanderbilt's Trousseau Read the inside fashion scoop of a society wedding. Miss Vanderbilt's Victorian wedding dress "was the handsomest seen in New York since that of Nellie Grant." Today's paparazzi has nothing on the society page authors of past centuries. The Most Fabulous Dresses Ever Created! Where would you find the most fabulous wedding dresses ever created… where else but in a museum? Many of these creations of lace and satin, from antique to modern design, can be found in near perfect condition in the costume collections of museums. Wedding Dress–1840 Elegant bridal gown is draped in marabou feather trimmings that transport the dress into a magical fairy tale scenario. Victorian Wedding Dress–1870s Both the bodice and skirt of the circa 1875-80 bridal gown are elegantly trimmed with lace frills and ruffles. Victorian Wedding Dress–1881 The bride appears in an elegant wedding toilette of white satin. The back of the gown forms a flowing princess train which can be designed either square or round. Civil War Era Wedding Dresses In 1861, Godey’s Lady’s Book advises that when one is considering a wedding dress, it will be seen that no person is confined to any single style or material. A bridal dress that would be becoming to a tall and slender figure would look absurd on a dumpy person. Silk Victorian Wedding Dress This elegant, yet simple, ivory satin gown with an attached wide gathered skirt is from the early 1860s. The neckline is trimmed with a handmade lace ruffle and the bodice features a back-laced closing. Underneath the bride wore a corset over an embroidered chemise. Layers of full petticoats worn with a crinoline hoop achieved the full bellowing skirt typical of the early 1860s. Wedding Cakes For a traditional wedding an elaborate wedding cake will hold the place of honor in the center of a beautifully decorated table. See pictures and learn history of wedding cakes and Wedding Cake Toppers. Victorian Rings Diamonds and snakes... symbols of love? 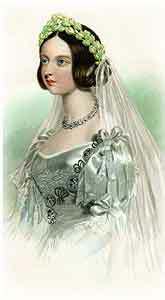 Victorian Wedding Traditions During the Victorian era, there was much importance put on a young lady’s wedding day. At an early age, young girls became familiar with curious rhymes and poems filled with suggestions and omens regarding the anticipated wedding day. Victorian Wedding Ceremony After the ceremony, the question sometimes arises whether the bride is to be kissed by the groom. Victorian Wedding Breakfast The wedding reception was called a Wedding Breakfast, a fashionable ball supper, lighted up by day instead of gas light. Proper Attire for the Victorian Groom A Victorian etiquette book tells the groom how to dress for the wedding ceremony. 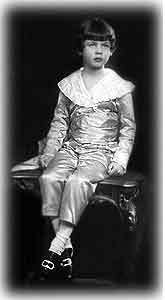 No fashionable Victorian wedding was complete without small boys dressed as pages or ring bearers. 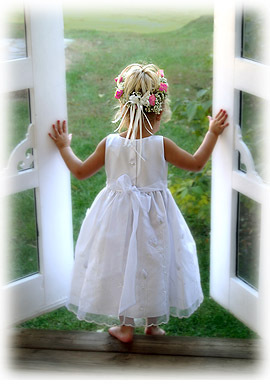 Little Girls in Victorian Weddings Charming practice of a traditional wedding is to have one or more picturesquely gowned children as flower girls to precede the bride from the altar scattering rose petals from delicate baskets in her path. 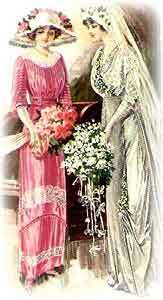 Victorian Wedding Guest Etiquette What to wear and what to bring to a Victorian wedding... learn what is required of the ideal wedding guest. Young Victoria's Royal Wedding Read about the dresses, ceremony, people and parties for Queen Victoria's wedding. The royal wedding cake was covered with pure white sugar and the top featured the figure of Britannia and the illustrious Bride and Bridegroom, who were dressed in the costume of ancient Greece. British Royal Weddings Explore the tradition, splendor and romance of the seven royal weddings. Over the last two centuries, royal weddings have evolved from strictly private occasions to international celebrations. The Valentine - A Tribute to Love Nancy Rosin explores the history of the Valentine. 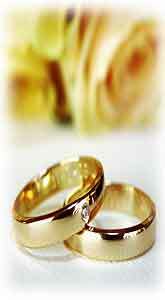 Rules of Engagement It is the privilege of the bride to name the wedding day . . . after the wedding invitations are issued she does not appear in public. Collecting Victorian Expressions of Love Featuring a collection of Victorian love ephemera. A Whisper to a Newly Married Pair, 1860 Advice to the husband - "You give your wife a certain sum of money … I really cannot see the necessity of obliging her to account to you for the exact manner in which she has laid it out." Love and Romance A limited edition love card, embellished with glitter, and adorned with an antique image, circa 1850. Dressing the Victorian Bride What was worn beneath those lovely wedding dresses? See a step by step description. Victorian Hair Styles Fashionable hair styles from the Victorian era, perfect for under a Victorian wedding veil. Book of Victorian etiquette - everything you need to know on how to behave in the Victorian era. Rules for courtship and romance occupy most of the space in Victorian etiquette books... there is generally one curt letter of refusal to a marriage proposal.